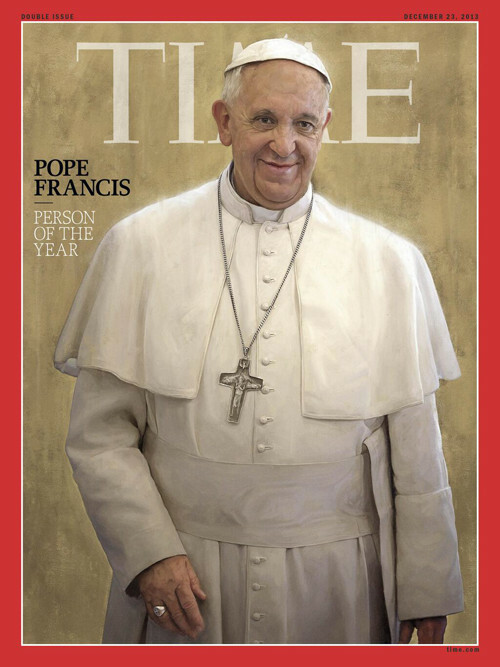 Pope Francis has been named Time magazine's Person of the Year for 2013. Time's managing editor Nancy Gibbs revealed the magazine's decision on NBC's "Today" Wednesday morning. Pope Francis, who gained world praise in 2013, became the first Jesuit pope in March 2013 following the resignation of Pope Benedict XVI. Time's managing editor Nancy Gibbs explained the magazine's choice on Wednesday, calling the Pope "a new voice of conscience." "In his nine months in office, he has placed himself at the very center of the central conversations of our time, about wealth and poverty, fairness and justice, transparency, modernity, globalization, the role of women, the nature of marriage, the temptations of power," she said. "When he kisses the face of a disfigured man or washes the feet of a Muslim woman, the image resonates far beyond the boundaries of the Catholic Church." "The Holy Father is not looking to become famous or to receive honors. But if the choice of Person of Year helps spread the message of the gospel-- a message of God's love for everyone-- he will certainly be happy about that." Edward Snowden, who made waves in 2013 with his leak of secret documents about N.S.A. surveillance activities, was the magazine's second choice. Some criticized Time for not choosing Snowden for the top slot, saying that the title had gone with a safe, popular decision instead of the right one. Gay marriage pioneer Edith Windsor, Syrian president Bashar Al-Assad and senator Ted Cruz rounded out the top 5 slots. Time said that it was the Pope's dedication to "humility" and his fight against poverty, among other things, that solidified its top choice this year. Earlier in July, the Pope was also named "Man of the Year" by Vanity Fair Italia.